Map of Chaghtai Khan's rule. 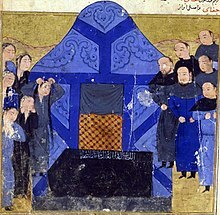 The funeral of Chagatai Khan. Chagatai's son Mutukan (Mö'etüken) was killed during the siege of Bamiyan in 1221. Early in May 1241 they entered Moravia. Then they continued via Brno, to join Batu's main army in Hungary. The destruction in Poland, Silesia and Moravia was all much of the same kind. In 1240 Baidar participated in the election of Güyük Khan in 1247. Moucy is mentioned by Giovanni da Pian del Carpine in his work History of Mongols whom we call Tatars (Ystoria Mongalorum). In Carpine's work Moucy controlled territory on the left bank of the Dnieper in the land of Comans (Cumans) and he was senior to Korenca (Kuremsa) who was on the right bank. Yunas Khan descended from Chaghatal Khan, the second son of Chlngiz Khan (as follows,) Yunas Khan, son of Wais Khan, son of Sher-'ali Aughldn, son of Muhammad Khan, son of Khizr Khwaja Khan, son of Tughluq-timur Khan, son of Aisan-bugha Khan, son of Dawa Khan, son of Baraq Khan, son of Yesuntawa Khan, son of Muatukan, son of Chaghatal Khan, son of Chingiz Khan. ^ William Erskine (1 Jan 1994). History of India under Baber. Atlantic Publishers & Dist. p. 577. ISBN 8171560326. Retrieved 2016-11-27. ^ Voitovycz, L. King of Poland Casimir III and a struggle for Romanovichi heritage (Польський король Казимир ІІІ і боротьба за спадщину Романовичів). "Lviv University Herald" (Вісник Львівського університету). Lviv 2011. page 8. ^ da Pian del Carpine, G. History of Mongols whom we call Tatars (История Монголов, которых мы называем Татарами). Translated by Aleksandr Malein. "State Publishing of Geographic Literature". 1957. This article incorporates text from The Tarikh-i-rashidi: A History of the Moghuls of Central Asia, by Edward Denison Ross, a publication from 1895 now in the public domain in the United States.